When it comes to websites, slow and steady definitely doesn’t win the race. Not only will slow websites frustrate and deter your visitors, they can also get dinged in search engine rankings. 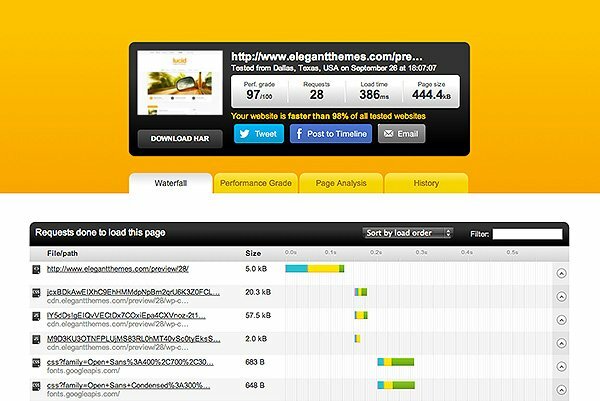 Here at Elegant Themes we try to code our themes to be speedy and efficient, but there is also a lot that you can do outside of the theme to improve performance. In this post, I will outline the most important steps to ensuring that your WordPress website is running at hare-like speeds. To start off, we will need a way of measuring the size and speed of the website in question. To do this we will be using the free tools at Pingdom.com. For the purpose of this post, I have created a fresh installation of Lucid on our servers that we can use to test. 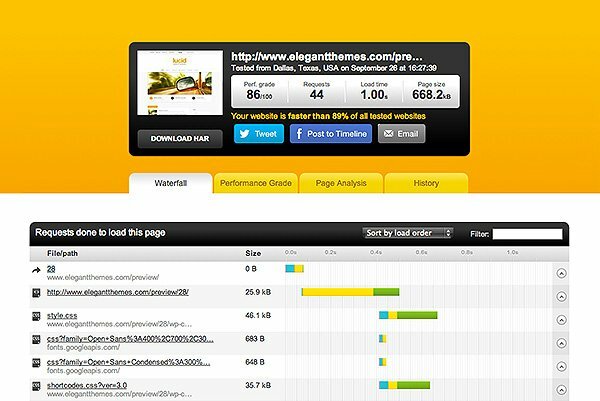 Using the Pingdom Website Speed Test tool, we can do an initial test of our page speed. Under “settings,” I have chosen to test from their Dallas Texas datacenter. It’s important to test from the same location each time. The test revealed a page size of 668kb, a page load time of 1 second, with a total of 44 requests. The first thing we are going to do is ensure that the website is being compressed before it is sent to our visitors. Allowing your server to compress your files before sending them to your visitors will decrease your page size by leaps and bounds. This can be done by enabling gzip. The method for enabling compression on your server will differ depending on your setup. For Apache, you can use mod_deflate. If you are using Litespeed, then there is a setting within the control panel to enable compression. Enabling HTTP compression is also fairly straight forward on Windows Servers. When your WordPress website is loading, there is a lot going on behind the scenes. PHP functions are being run and MySQL database are being queried to decide exactly what should be output to your visitor for that given page. The less intensive the queries on the page the better, and the only thing better than less queries are none at all! Using a cache plugin, you can create a static version of your website and have it served instantly to your visitors. Not only does this make your website load faster, it also lessens the load on your server’s CPU, Memory and HD. There are a few great Caching Plugins out there, and I would suggest using W3 Total Cache. Once installed, you can enable Page Cache under the Performance > General Settings tab. Implementing a CDN can drastically increase your website’s speed, even if you don’t notice the results at home. On a standard website host, your files are being stored on a single server at a single location somewhere in the world. The closer your visitors are to the datacenter in which your files are stored, the faster they can access them and the faster your website will load. For those visitors who are visiting your site from overseas on the other hand, it might be taking a long time for that data to make it across the ocean and into their browser! What a CDN does is distribute your files to various datacenters all around the world, making it much more likely that there is a server closer than your own to each person that visits your website. The visitor is then served your files from the closest server, thus improving your website’s loading speed. In this example, I used MaxCDN on our test installation. Fortunately, W3 Total Cache also has an option for integrating MaxCDN automatically – quite convenient! Hey Nick, it would have been great if you have included few .htaccess tricks. Anyway still handy articles to improve page load speed. Thank you for your work guys. Ashmita Dobariya, here’s a bit of .htaccess information for speeding up WordPress: http://coreyjmahler.com/2012/12/15/speed-up-your-wordpress-site-enable-gzip-and-browser-caching/. That’s really great, finally I got to know, how gzip can help to improve my site. Trying to Enable gZip Compression on my site. Good luck 🙂 If you don’t have compression enabled, you should see a huge improvement! I also use gtmetrix a very detailed . Just have not been able to hack in order to get an “A” grade. Thanks for the tip. I have never used gtmetrix before, but it looks great. Tried some of these and beware. Took me over an hour to deal with the litespeed… If you have to change your site… Don’ t use litespeed. Sorry to hear that Jay. I have found compression to be very easy to enable on litespeed, but I certainly can’t speak for everyone. If I may add… Never use the “auto” setting in minify with W3 Total Cache. Use ‘manual’. You have to be really careful using ‘minify’… Especially, jquery and many of the js files. They will break your site. Not worth bothering with. Thanks for the suggestion Bernard. It’s true that minfying can cause problems, which is why I warned that you should thoroughly test your site after using the plugin! It’s great to minify whenever possible. I would like to disable some jquery files which we dont use. for eg: Vertex theme – i am not using the Featured slider and code loads everytime and making it heavy to load. Our blog is Lots of images, so customizing it will make it more easy ! Using CDN also. Bernard, if only I had read your post before I installed W3 Total Cache and it completely broke my site! Which wouldn’t have been so bad if WordPress Backup to DropBox hadn’t also stopped backing up my site without me knowing. 🙁 Things are now back up. I uninstalled W3 and I’m using Quick cache. Too afraid to try to minify again. 🙂 Thanks! Nice article / tips… However, my advice would be only to make use of a CDN when your website is ready… Still in developing stage this could give lots of caching issues on the CDN. I would love if you could elaborate Herre! I am not sure what problems you are referring to. Optimize images! That should be most obvious as that dates back to the days of dial-up modems. But still people take that for granted. Also, keep your image sliders small. The fewer slides, the better in terms of page load and usability. Finally, leverage fonts in place of icons, such as the amazing Elegant Font (http://www.elegantthemes.com/blog/resources/elegant-icon-font). Fonts are generally less weight than images, and can also be tweaked down with third-party tools like IcoMoon (http://icomoon.io/) to eliminate unneeded icons in the font, helping the font to load that much faster (or to add your own icons, or mix-and-match icon fonts (license-permitting)). Thanks for the tips, Nick! You’ve transformed the blog into a powerful resource and a thriving community! Had been deploying some of these techniques, but not all. Saw immediate improvements. Thank you! Another decent benchmarking site that I use is gtmetrix.com. It also offers some good tips on how to enhance site performance. That’s great to hear Cliff. Someone else also mentioned gtmetrix, and it looks like a great site. I have problems with Pingdom from time-to-time, so it’s good to have another option. Nick, how does serving cached pages work with blog posts that have active discussion going on? My experience with caching (it was at the server level, not a plugin) created serious problems for a teaching site I run, both for me and for my students. For me as admin, I was having a serious problem making updates or edits to an existing post/page, because I didn’t consistently get a fresh page load. I might have to wait several minutes for the cache to clear before I can view the the site to make sure the updates had gone through. For my students, they didn’t always get the latest content, and frequently, their comments wouldn’t appear for several minutes. The problem ended when the server side caching was turned off, so I’ve been wary of using cache plugins. What’s great about W3 Total Cache, is that is has some settings based around when to clear the cache when new content is created. You can have the plugin purge the page cache automatically when new comments are added. More useful (at least 2+ years later) is that you can exclude parts of the page (i.e. comments section) from caching, and/or disable caching for logged-in users. Thanks for the Tips, Nick! Muy buena aportación! Gracias Nick y su equipo. Excellent advice – however, on my Cybershrink service for Therapists’ Websites, I have avoided using W3 Total Cache’s CSS & JS minification – it can sometimes be a little iffy and breaks the page. Instead, I use W3TC for page caching and database caching (reliable and good speed improvements) and use Google’s mod_pagespeed for on-the-fly HTML & CSS minification and page-element rewriting. You have to have access to your web server’s software (eg Apache) to install this module. Thanks for the suggestion Dean. I have never used Google’s Pagespeed Module, but it looks really interesting. It’s true that you need to be careful when blindly minifying all of your scrips. Optimize your database every couple weeks. There are a couple plugins available to handle that. I had a client using the All in One Events Calendar where its sessions file ballooned to 620+ MB! Talk about slowing things down! One question-is there a G+ Page for Elegant Themes? I really love what Brian Gardner and his team are doing at StudioPress…We could emulate that for ET as well. Very good tips! Thak you! These are tips is useful to Improve WordPress Loading Speeds, Thanks for sharing. We’ve run W3 and Supercache for the last couple years, and inevitably, when one of my sites gets hacked, the hackers got in through the cache. I like the idea of caching software, but hate having to troubleshoot and clean up a site. I am using all the tricks you mentioned except gzip compression. I want to know which is the best plugin to do it automatically..
You can use gzip from your server backend …. Hey Nick, have you tried testing pingdom after integrating Google page speed service? I use a shared server from Just Host so I have to compress files via htaccess. thanks for sharing and helpful post. Awesome Tips! But I have one question. How can we decrease the loading time of Jquery and CSS in the theme, I am facing that problem and I can’t resolve it! Help me! Great tips, I should get my team to implement them all one-by-one. My website currently scores 71/100 in the speed test, I’ll get back to you with the new results after we deploy the solutions proposed here. Thank you for writing information about Page Loading Time and speed issue. Most of the website owner does not care about their website loading time. I want to write my opinion. Recently I came to know that Google now counts site speed as a ranking factor. So, if any website owner want to rank top in Google SERP then it is necessary to care about site loading time and speed. You have suggested tools and tips to speed up website speed. It will help many webmaster. Thanks for this much info regarding the server load.Some times some plugins can make your WordPress site loads slower. Thank you for sharing Nick! Pingdom website speed test Tools is a very functional tool you are providing here to know the speed of loading time and nevertheless, thanks for the nice tips which are essentially useful. because i’m a little confused with so many options we have to select on minify js and css. Now i guess this one will really help me!! I will implement these tips for my website. Excellent tips on improving loading speeds, thank you! I love to write with lots of images(around 9 to 10 images) per article. But now i am getting worried about my blog speed. Can smush.it plugin will help me. Do you have provided all in one plugin to provide the better speed ? I am just suffering from page load speed as I get notification from Google to enhance my site load time. These tips surely help me. By applying the following really the speed of the page had increased. For speed up rendering youtube players. Another uselful tip in speeding up the website and taking the load of the server. Most shared host support One Click Cloudflare CDN installation. People can see improved speed and reduced load on their shared hosting after Cloudflre has been installed for few days. 1) We got great results from “WP Fastest Cache.” It’s super simple to implement, consolidates and minifies JS and CSS, and is super responsive. 2) We then used CloudFlare as a CDN. Interestingly, the JS/CSS optimizations from WP Fastest Cache were better than those of CloudFlare. 3) After profiling our site, we realized that we had a plug-in using TimThumb, and the PHP file (plus query string) in the image link was causing images to not be cached, so we used this link (http://revisedagain.com/2011/custom-rewrite-rules-with-wordpress-timthumb/) to make them cacheable. Was able to get the page load from 5000ms to under 500ms (even less with a primed local cache). Nice post, but too generic, I think. 160% performance improvement? You’re definitely doing something right! It would be nice if you went into more detail for those of us who don’t yet know the right techniques. Recently I’m of the opinion that plugins don’t do quite as much for site optimization. Good old manual tactics is the way forward. The problem always occurs with the minification of JS and css in my site. The load from the revolution slider plugin. I have turned off another plugin that used 66% of the site loading time. Nothing but the great Next Gen Gallery. And, I don’t think using CDN actually improve a WordPress site’s loading. Thanks for sharing an awesome post about how to improve loading time. I already had installed a W3 total cache plugin. This plugin is working well on my blog. But can you please suggest me any free CDN that will also help to decrease page load time ? I am not aware of any free CDN services. Such a service will likely always be commercial, since you are paying for the resources you use. is a must and not only some fancy add-on. I hope to get some constructive solution from support shortly. I have hosting on godaddy.com. Working on SEO last couple of days. Load speed in general is acceptable but I have problem with GZip compression. I actually don’t mind if is working there or not I’m happy about Google score 86/100 about the theme and so on. Minify CSS for the following resources to reduce their size by 11.2KiB (13% reduction). Minify HTML for the following resources to reduce their size by 2.9KiB (12% reduction). I don’t really mind if page can work any faster it could be super fine but my first problem is that I’m getting because of this “errors” lowest SEO rating. And yes W3 Total Cache is not an option because godaddy.com doesn’t allow it. I would be more than please for your suggestion to resolve my issues. W3 Total Cache actually enables gzip, too. These are all useful tips, particularly the GZip compression. It’s useful for especially for developers because it excludes from HTML files generated by both, plugins and themes. Entire optimization process takes a few moments because it’s very simple solution based on top admin menu. It would be great if you can share some code that how to solve loading problem with code rather than installing plugin. My site speed was reduced drastically after moving from wp super cache to w3 total cache, but every other things was improved, but not all that much. This ppost has been for years now, am not much assured if my issue can be attended to. But please do have a look at it. And tell me what am missing out. Beside, I enabled database caching, any negative effect, as it is not so with wp super cache? Very helpful article, I was able to speed up my website following the methods that you discussed. Earlier I knew the cache plugin only. But I was still looking to improve the loading speed. I found this post very useful. Compressing the static resources seem to be the key for the improvement. Do you think there is a scope of improvement yet? Lots of things to do now.Thanks for the info.I needed to speed up my site. You should mention about Cloudflare who can not afford MaxCDN. W3 Total Cache along with Cloudflare works like a charm. Trust me! I’ve been using both for a long and results are awesome. You forgot to add something…Wordpress is resource hog and a normal shared hosting wouldn’t work very well. If you receive huge traffic, you need either an expensive VPS hosting or at least a managed hosting. A fast web host plays a significant role in load speed of a site because at the end it’s the server that has to respond fast. No matter what you do to speed up the load speed, your hosting should respond within 300-500ms (average). Holy mackeral – don’t remember all the numbers from the first test but increased my ranking from 54% to 91%. And I only did the WP Cache plug in and the Minify setting. Thanks Nick – Divi is the greatest. I have three sites that I’m very happy with and I’m not even close to being a developer. Those are great tips on the improving the website speed. However they focus mostly on client side. To make sure a website is performing perfectly, one needs to check their website’s speed from the server side too. A speedy web hosting is needed if you want to increase the overall performance. In order to check whether a server is up to standard (200ms response time according to Google), you need to use a server speed checker like http://www.bitcatcha.com/ to test the server. If you are getting a very bad server response time, your site will still be slow even you have scored flying color in the client-side optimization. actually i have a ecommerce website. my wesite speed is to slow when i compress my images.my yith zooom magnifire is not work properly and also when i optimize css and html and js then the home page is not dispaly properlly…..
To reduce the unnecessary HTTP requests, you can use “WP Asset Clean Up” (https://wordpress.org/plugins/wp-asset-clean-up/) to prevent specific scripts (.JS) & styles (.CSS) from loading on pages/posts and home page. Combined with Plugin Organizer and a caching plugin, it will make a huge difference in loading time.